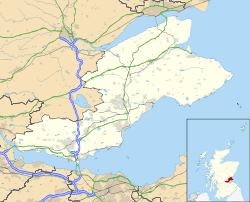 Burntisland (/bɜːrntˈaɪlənd/ listen , Scots: Bruntisland) is a royal burgh and parish in Fife, Scotland, on the shore of the Firth of Forth. According to the 2011 census, the town has a population of 6,269. The civil parish has a population of 6,383 (in 2011). Early evidence of human activity in this area has been found in rock carvings on the Binn, thought to be about 4,000 years old. The Roman commander Agricola used the natural harbour and set up camp at the nearby Dunearn Hill in AD 83. The earliest historical record of the town was in the 12th century, when the monks of Dunfermline Abbey owned the harbour and neighbouring lands. The settlement was known as Wester Kinghorn and developed as a fishing hamlet to provide food for the inhabitants of Rossend Castle. 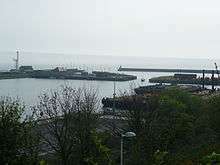 The harbour was then sold to James V by the abbots of Dunfermline Abbey in exchange for a parcel of land. The land was granted royal burgh status by James V in 1541. When the status was confirmed in 1586, the settlement gained independence from the barony of Kinghorn and was renamed Burntisland, possibly a nickname from the burning of fishermens' huts on an islet now incorporated into the docks. The town became so well established that a new church known as St Columba's was built in 1592. This was the first new parish church built in Scotland after the Reformation. It is a unique shape, square with a central tower upheld on pillars, and lined all round with galleries, to allow the greatest number of people to be reached by the minister's words during the service. The church contains one of the country's finest collections of 17th- and early 18th-century woodwork and paintings. Substantial remains of the original parish church, built in the late 12th century, survive in a churchyard to the north of the old town. Burntisland developed as a seaport, being second only to Leith in the Firth of Forth, and shipbuilding became an important industry in the town. 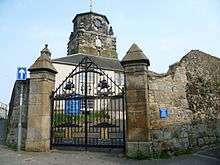 In 1633 one of the barges, the Blessing of Burntisland, carrying Charles I and his entourage's baggage from Burntisland to Leith sank with the loss of Charles' treasure. In 1601, King James VI chose the town as an alternative site for the General Assembly of the Church of Scotland. This was when a new translation of the Bible was first discussed, a project which James brought to fruition a decade later in the King James Bible. Burntisland was held by the Jacobite army for over two months during the rising known as the Fifteen. The Jacobites first of all raided the port on 2 October 1715, capturing several hundred weapons, then occupied it on 9 October. They held it until it was recaptured by the Government on 19 December. Burntisland became an important port for the local herring and coal industries, and in 1847 the Edinburgh and Northern Railway opened from Burntisland north to Lindores and Cupar. By 1850 the world's first roll-on/roll-off rail ferry service was crossing the Firth of Forth between Burntisland and Granton, enabling goods wagons to travel between Edinburgh and Dundee without the need for unloading and re-loading at the ferries. 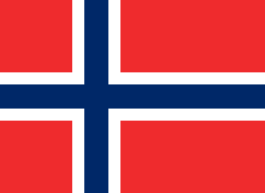 (Passengers however had to disembark and use separate passenger ferries). This operated until 1890 when the Forth Bridge opened. In the late 19th century, the area experienced a short-lived boom in oil shale mining and processing at the Binnend Works. 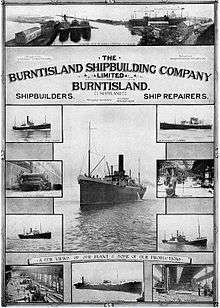 The Burntisland Shipbuilding Company at Burntisland West Dock was founded in 1918 as an emergency shipyard for the First World War, specialising in cargo ships. In 1929 the yard introduced the "Burntisland Economy" steamship, which was designed to maximise fuel economy. The popularity of this design helped the yard to survive the Great Depression. In the Second World War the yard continued to concentrate on merchant ships but also built three Loch class frigates: HMS Loch Killin (K391), HMS Loch Fyne (K429) and HMS Loch Glendhu (K619). By 1961 the shipyard had 1,000 workers but in 1968 the company got into financial difficulties. The shipyard closed in 1969 and was sold to Robb Caledon of Leith. Robb Caledon eventually secured orders to for the yard to build modules for the North Sea oil and natural gas industry, and formed its Burntisland Engineering Fabricators (BEF) subsidiary to manage this work. Towards the end of the 1970s orders declined, in 1978 Robb Caledon was nationalised as part of British Shipbuilders and in 1979 Burntisland yard was closed. In 1990 under new owners Burntisland West Dock resumed the production of major offshore oil and gas fabrications. Industry related to North Sea oil remains important for the town. In 2001 a management buyout took over the yard as Burntisland Fabrications or BiFab. BiFab describes itself as the only major fabricator continuing in production in Scotland since 2005. A plant for the refining of alumina was opened early in the 20th century and closed in 2002. The town is also home to the eleventh-oldest golf club in the world, Burntisland Golf Club (The 'Old Club', as it is known among its members). Although it is not a course-owning club, its competitions are held over the local course now run by Burntisland Golf House Club. 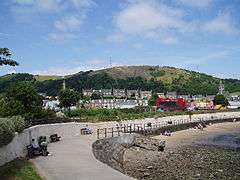 Burntisland is home to the second oldest highland games in the world starting in 1652. The Games take place on the third Monday of July, the start of the Fife/Glasgow fair fortnight, and a local market and summer fairground takes place on the same day. The town currently has only one school, Burntisland Primary School, for which a new building has recently been built on the Toll Park. The school first opened in 1876 and is spread across five separate buildings on Ferguson Place. The school roll is around 570 pupils with 20 pupils in the adjacent nursery. A review of site options and a cross-serving working group have identified East Toll Park as a preferred option for a replacement Burntisland Primary School. The majority of secondary school pupils attend Balwearie High School in nearby Kirkcaldy. Immediately to the west of Burntisland railway station lies the 9-span Viaduct forming a significant feature in the harbour area of the town. 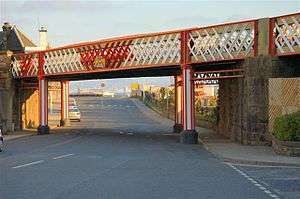 Built in 1888 to carry the main railway line from Edinburgh to Dundee, it is now a Category C Listed structure, being a rare example of a surviving Town truss. In the summer months the annual fair comes to town and there is also the second oldest highland games in the world held on the third Monday every July. The Beacon leisure centre has a 25m swimming pool with a wave machine as well as water flumes and a small children's pool with a variety of pool toys. The Burntisland and District Pipe Band compete in Grade 3B after being promoted from Grade 4B after a successful 2014 season. The band are 2014 British, U.K and European and World Champions. The band is known throughout for its development with children in the local area, creating players that now compete in Grade 1. A major part of Burntisland's economy is retailing. There are a number of shops, stores and cafes and even a bookmakers in the town with many being privately operated businesses owned by residents. In recent years the town's High Street has seen significant redevelopment to attract retailers to properties and encourage visitors through convenient car parking. Burntisland also benefits from its lower than average crime rate. Burntisland railway station serves the town and provides direct links with, amongst other stops, Kirkcaldy to the north and Edinburgh to the south. The only issue is that platform 2 which goes towards Kirkcaldy has no disabled or children in buggy access . Regular bus service 7 is operated by Stagecoach Fife, which covers most areas of the town. 1 2 "Scotland's Census 2011- Burntisland Locality Area Profile". www.scotlandscensus.gov.uk. 2011. Retrieved 20 March 2014. ↑ Simon Taylor; Gilbert Márkus (2006). The Place-Names of Fife, Volume One. Shaun Tyas. ISBN 1-900289-77-6. 1 2 3 4 5 6 "Burntisland Shipbuilding Co". Grace's Guide: The Best of British Engineering 1750-1960s. 29 January 2009. Retrieved 22 May 2011. 1 2 3 "Welcome". Burntisland Fabrications Ltd. Burntisland Fabrications Ltd. Retrieved 15 June 2011. ↑ "A list of primary schools in Fife". Fife Council. Retrieved 16 February 2011. ↑ "Burntisland Primary School". Fife Council. Retrieved 2 July 2009. ↑ "Assurances on progress of all region's school projects". The Courier. 1 October 2010. Retrieved 16 February 2011. Wikimedia Commons has media related to Burntisland. Wikisource has the text of the 1911 Encyclopædia Britannica article Burntisland.